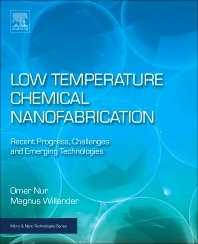 Low Temperature Chemical Nanofabrication: Recent Progress, Challenges and Emerging Technologies offers a thorough and theoretical background to nanoscale fabrication phenomena, also covering important practical applications. It covers the conventional top down and the newly emerging bottom up processing methods. The latter has proven to be feasible for obtaining device quality material and can either be performed using high or low temperature processing. Low temperature (˂100 oC), in particular, is becoming increasingly used due to its simplicity and varied applications, with huge benefits for developing new devices and flexible non-conventional substrates. This important resource is ideal for researchers seeking to learn more about the fundamental theories related to nanoscale phenomena and nanofabrication. Omer Nur acquired his B. Sc. Honors degree in Physics from the University of Khartoum in 1986. He was then awarded a the Ph. D. Degree in Device Physics from the University of Linköping in 1996. During the years 1996 and 2004 he worked as a researcher at Chalmers University of Technology and also at Gothenburg University. In 2002, he was made Associate professor (Docent in Physics) at Chalmers University of Technology. In the year 2007, he been appointed as Senior Lecturer at the Department of Science and Technology (ITN) Campus Norrköping, Linköping University. Professor Magnus Willander was full professor in nanophysics and mesoscopic physics in the Department of Physics at Gothenburg University between 1995 and 2006. Since 2006, he has been Full Professor in the Department of Science and Technology (ITN), Linköping University. He has worked with the Tokyo Institute of Technology, as visiting scientist, as well as guest professor at Gothenburg University during 2008 and 2009. His research focusses on materials and devices and combines experimental and theoretical research into these areas. Over the course of his career, he has published near to 850 papers and seven books.